PALEO SHRIMP-STUFFED MUSHROOMS - Underground Fitness Dun Laoghaire | Bray | Dublin & Wicklow - Personal Training, Group Training and Bootcamps. 2. Clean your cremini mushrooms and remove the stems. 3. Place the mushrooms on a foil-lined baking sheet, and brush them with melted coconut oil. 4. Roast the mushrooms, gill-side down, for 12 minutes. 5. Flip over the mushrooms, and roast for 5 to 10 minutes more, or until the liquid released by the mushrooms has evaporated. 1. De-vein and remove the tails from the thawed shrimp, and chop them into medium-sized pieces. 2. Toss the shrimp, scallions, cilantro, bacon, jalapeño, and fish sauce into the work bowl of a food processor. Season to taste with salt and pepper. 3. Pulse the ingredients for the filling until a coarsely-chopped mixture develops. The filling should be the consistency of a sticky, chunky paste. 4. Scoop out the filling with a spoon and fill each cooked mushroom with the shrimp paste. 5. 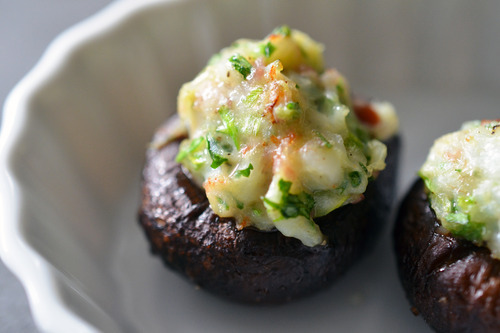 Return the mushrooms to the oven for 8 to 10 minutes, or until the shrimp mixture has set. 6. Transfer the mushrooms to a plate and serve.